Ethanol, also known as ethyl alcohol, grain alcohol or just alcohol, is a flammable, colorless chemical compound. Drinks with 0.5% or more ethanol are called alcoholic. When people talk about it, they often name it simply as alcohol. Its chemical formula is C2H5OH, also written as C2H6O. 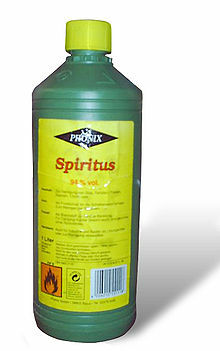 It is used as a solvent because it can dissolve many other chemicals and is not very toxic. Yeast makes most of the ethanol that people use. Most cars in the U.S. can run on fuels that have of up to 10% ethanol in them. Car makers like Ford, DaimlerChrysler, and GM also make vehicles specifically designed to run on higher ethanol blends. Some of their engines can run on up to 85% ethanol (E85). By mid-2006, there were about six million E85-compatible vehicles on U.S. roads. ↑ 2.0 2.1 2.2 2.3 Haynes, William M., ed. (2011). CRC Handbook of Chemistry and Physics (92nd ed.). Boca Raton, FL: CRC Press. p. 3.246. ISBN 1439855110. ↑ Ballinger P, Long FA (1960). "Acid Ionization Constants of Alcohols. II. Acidities of Some Substituted Methanols and Related Compounds1,2". Journal of the American Chemical Society 82 (4): 795–798. doi:10.1021/ja01489a008. ↑ Arnett EM, Venkatasubramaniam KG (1983). "Thermochemical acidities in three superbase systems". J. Org. Chem. 48 (10): 1569–1578. doi:10.1021/jo00158a001. ↑ Lide DR, ed. (2012). [Ethanol at Google Books CRC Handbook of Chemistry and Physics] Check |url= value (help) (92 ed.). Boca Raton, FL. : CRC Press/Taylor and Francis. pp. 6–232. ↑ Lide DR, ed. (2008). [Ethanol at Google Books CRC Handbook of Chemistry and Physics] Check |url= value (help) (89 ed.). Boca Raton: CRC Press. pp. 9–55. ↑ "NIOSH Pocket Guide to Chemical Hazards #0262". National Institute for Occupational Safety and Health (NIOSH). This page was last changed on 12 March 2019, at 08:33.